Authorities in Greece have been battling wildfires in several locations near the capital Athens. More than 150 firefighters were called to tackle the fires which broke out on Saturday and spread in high winds. Three of them were reported injured. 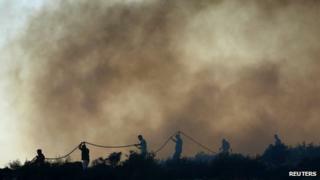 The biggest fire was reported to be near the town of Keratea, 50 km (30 miles) south of Athens. It is believed the fire was started by sparks from welding work at a construction site. Four people have been arrested for accidentally causing the fire. An old people's home in the area was evacuated as a precaution, authorities said. "We are asking for more help, for more fire engines," local MP Evy Christofilopoulou told the Associated Press. "We are trying to coordinate and people are frustrated and very anxious as you can realise." Another fire in the Athens suburb of Pallini damaged a factory, with at least two other fires reported near the capital. Greece has asked Italy, France and Croatia for help in the form of more firefighting planes. The fires come as Greece goes to the polls on Sunday for a general election. Authorities said the opening of ballots in the Keratea and Lavrio areas would be delayed but that voting will be held as planned, the AFP news agency reports. In 2007 Greece declared a state of emergency when more than 60 people died in a wave of forest fires. Forest fires - a continuing Greek tragedy?